RYANAIR AVIATIONS MOST EXPLOITED AIRLINE WORKFORCE .We are in no way affiliated with Ryanair. : COMMONS SELECT COMMITTEE PROMPT INVESTIGATION OF RYANAIR EMPLOYMENT PRACTICES. 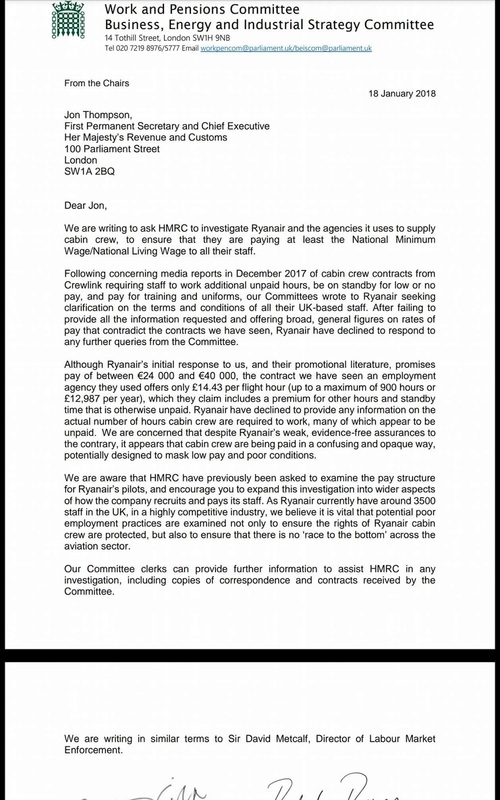 HMRC and RECRUITMENT OF LABOUR MARKET ENFORCEMENT TO INVESTIGATE RYANAIR and AGENCIES CREWLINK IRELAND and DALMAC'S WORKFORCE INTERNATIONAL USED TO SUPPLY PROBATIONARY CABIN CREW. COMMONS SELECT COMMITTEE PROMPT INVESTIGATION OF RYANAIR EMPLOYMENT PRACTICES. 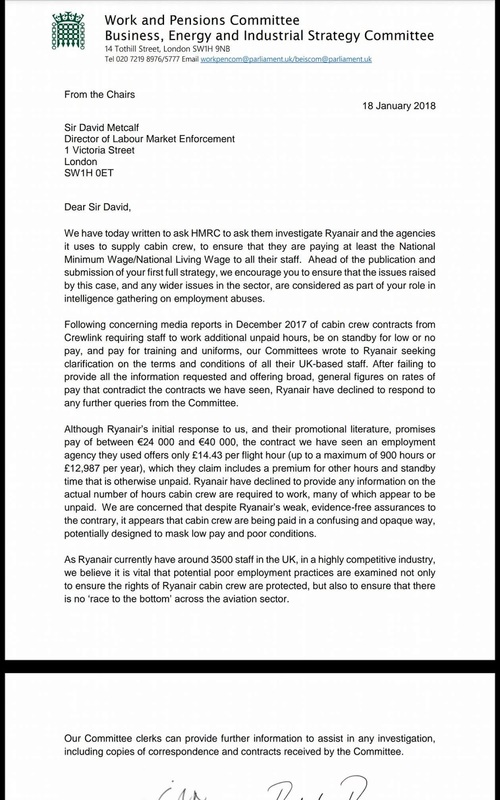 HMRC and RECRUITMENT OF LABOUR MARKET ENFORCEMENT TO INVESTIGATE RYANAIR and AGENCIES CREWLINK IRELAND and DALMAC'S WORKFORCE INTERNATIONAL USED TO SUPPLY PROBATIONARY CABIN CREW. Commons Select Committee asking, HMRC and the Director of Labour Market Enforcement asking them to investigate Ryanair and the agencies (Crewlink Ireland and Dalmac's Workforce International )used to supply cabin crew. 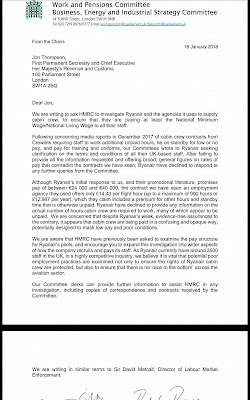 Following Ryanair’s refusal to cooperate with requests from the Work and Pensions and Business, Energy and Industrial Strategy Committees, the Chairs of the Committees have written to HMRC and the Director of Labour Market Enforcement asking them to investigate Ryanair and the agencies used to supply cabin crew. The Committees were responding to reports of cabin crew being required to undertake unpaid work, pay for training and uniforms, and be required to take significant periods of unpaid leave; all of which could mean that agency workers were being paid below the National Living Wage despite hourly pay rates being advertised above the legal limits. Attempting to hide behind commercial confidentiality An initial response from Ryanair ignored many of the questions the Committees asked, and provided broad average figures that did not reflect the reality of a contract the Committee had seen. Following a request for further information, Ryanair have declined to answer any more questions, instead attempting to hide behind commercial confidentiality and their Irish base. Writing to HMRC and to Sir David Metcalf, the Government’s Director of Labour Market Enforcement, Frank Field MP, Chair of the Work and Pensions Committee and Rachel Reeves MP, Chair of the Business, Energy and Industrial Strategy Committee, have said: Despite Ryanair’s weak, evidence-free assurances to the contrary, it appears that cabin crew are being paid in a confusing and opaque way, potentially designed to mask low pay and poor conditions. We believe it is vital that potential poor employment practices are examined not only to ensure the rights of Ryanair cabin crew are protected, but also to ensure that there is no ‘race to the bottom’ across the aviation sector. 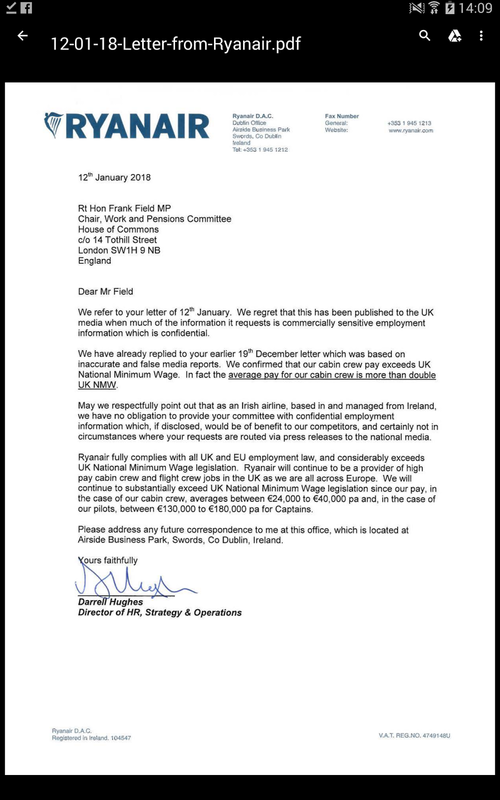 Rt Hon Frank Field MP said, We and the public can draw our own conclusions about Ryanair’s comprehensive failure to answer allegations on its pay and employment practices, only some of which were about the National Minimum Wage. 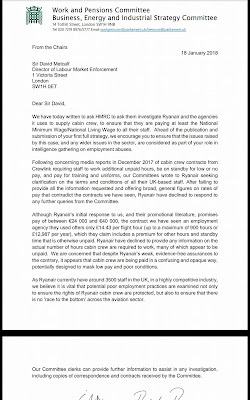 All companies are accountable to the law where they operate, and while it is not in our remit to enforce that law, HMRC already is investigating Ryanair for its pilot employment practices. We’ve asked them to extend that to the cabin crew, and referred the case to the UK’s new Director of Labour Market Enforcement. Ryanair should be on notice: you cannot hide behind the tired old smokescreen of “commercial confidentiality” for much longer. Rachel Reeves MP said: Ryanair might want to dodge our Committees’ questions and hide behind excuses, but the UK is the largest provider of workers to the company and we must be sure that everyone working for Ryanair is receiving fair pay and reasonable working conditions. Our report, ‘A framework for modern employment’ found that companies can expect an investigation only once every 500 years under the current labour market enforcement regime. Workers cannot afford to wait for fairness. I expect HMRC to take these issues seriously and look at Ryanair’s practices as a matter of urgency. 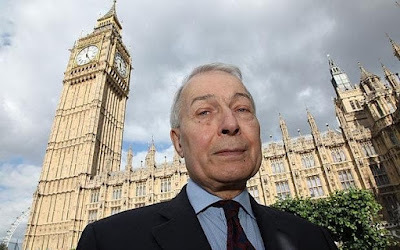 Ryanair's final letter to Rt Hon Frank Field 18th January 2018..